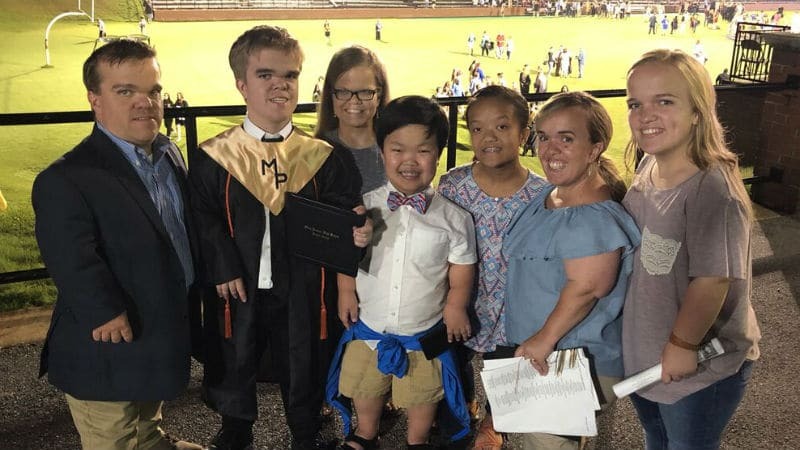 7 Little Johnstons will be returning with a brand new season in just a couple more days. A few weeks ago, we gave you a preview of what to expect as the Johnstons navigate this next chapter in life. Viewers have been waiting for the return of the show and now, we have something to tie them over until Tuesday’s premiere. Monsters & Critics had a chance to speak with Amber and Trent Johnston and ask some fun questions for fans to enjoy. As we wait on the return of 7 Little Johnstons, here is what the stars had to say. Monsters & Critic: Why did you guys decide to adopt and is more adoption in the future? M&C: Do you guys feel like you can relate to the Roloffs (from Little People, Big World) at all and have you met them? Amber & Trent: Relate? Well, from the standpoint of having dwarfism, sure! Our lives, lifestyles, and family dynamics are very different. M&C: What has been your favorite part of parenthood and the least favorite? Amber & Trent: Favorite part of parenting would have to be teaching, guiding and growing as a family. Least favorite is 100 percent the teenage years! M&C: Obviously, discrimination is a real issue in the world today. How do you guys deal with it and how have you encouraged the children to handle it? Amber & Trent: Discrimination is absolutely a real issue in 2018. It’s not a matter of dealing with it, it’s a matter of overcoming it! Trent and I encourage the kids to set high standards, face the facts, achieve goals, and do not get discouraged. It’s up to you to educate (the employer, school, doctor, etc) and prove you CAN and WILL do whatever is necessary. M&C: How does running a household with five children look? Like what are your routines and tips for other parents who have large families? Amber & Trent: I feel our household is kept fairly organized. One thing Trent and I have always strived to make sure is that each kid is individual. They each have their own likes/dislikes, interests, friends, etc. Therefore, our house is busy, stressful at times, but fun!! M&C: If you could do any other reality show, which one would it be and why? Amber & Trent: Pretty sure we wouldn’t! Our show is us, truly our lives. That’s what we set out to do when we were offered this opportunity! We strive to educate, entertain and relate to our viewers by being who we are every day. M&C: What is everyone’s favorite television show? Amber & Trent: Trent doesn’t watch a whole lot, but car shows and History. Amber & Liz: SVU. Jonah: anything sports. Anna: too many to name, dancing, bachelor, etc. Emma: ShadowHunters. Alex: power rangers. M&C: What is one piece of advice that someone else gave you that you implemented and works? Amber & Trent: Be true to who you are! M&C: Where do you see your family in 10 years? Amber & Trent: Kids graduated, moved out and enjoying careers, spouses and maybe a grandkid or 2. M&C: If you could change one thing from this reality television journey, what would it be? Amber & Trent: We’re not sure…probably what outsiders, family, friends assume about us and the show. M&C: What is your favorite family tradition that you all look forward to each year? Amber & Trent: We love summertime and the annual trips that come along with it. LPA national conference, beach, extended family visits. M&C: Anything you can tell us about what to expect on the new season? Amber & Trent: This season, the kids have grown and matured a lot since the last, so it’s definitely emotional and much deeper than the past seasons. Of course, humor and high energy are in every episode! Season 4 of 7 Little Johnstons premieres Tuesday, October 30 at 8/7c on TLC. What did Anna do to get into trouble on 7 Little Johnstons?